The possibilities are endless with wire crochet designs. Yoola Design's particular method is really wire knit as the result looks like knitting. But the jewelry and home decor pieces are created using a crochet hook. 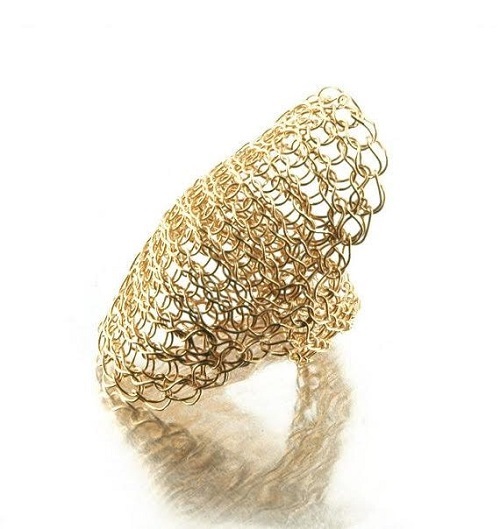 Yael Falk is back with a wonderful giveaway of her latest Cleopatra Shield Wire Crochet ring kit. It comprises of the materials and tools you need to learn how to make this ring and also learn the basic technique. The instructions are in the form of a PDF AND a video tutorial. If your New Year's resolutions include learning a new skill, maybe this will be the one? Check out Yoola Design for other tutorials, kits etc for that holiday money spending! I had previously reviewed one of Yoola Design's tutorials and adorned some metal bangles with the wire crochet tubes. Yael also teaches how to begin the tube without her looms but I have found starting with her orange plastic looms is easier as the foundation stitches are even. I had trouble with the Viking Knit draw plate I had back then because the holes were too small. So Yael sent me her draw plate to try. There is a big difference as you can see above. I actually rolled my first tube for my previous design until it was small enough to go through my draw plate. Not ideal as I had to watch for evenness. But this time, I could easily draw down by pulling the work through several holes until I got down to the size I wanted. I like using some waste wire to start with because it doesn't matter if I distort that section when I am pulling it through! Yael's jewelry style is contemporary. But you can use the wire technique to create different looks of your own as I have done. I adorned the front section my leather cord necklace with the compressed tube and secured with additional wire coil work. I also made the wire coil end caps and clasp using 16G wire courtesy of Parawire. The focal is a cloisonne pendant. As you can see I added the pendant for color and visual interest. Yael is teaching at the Polymer Clay Adventure 2017 where she shows how to use her wire work technique combined with polymer clay. 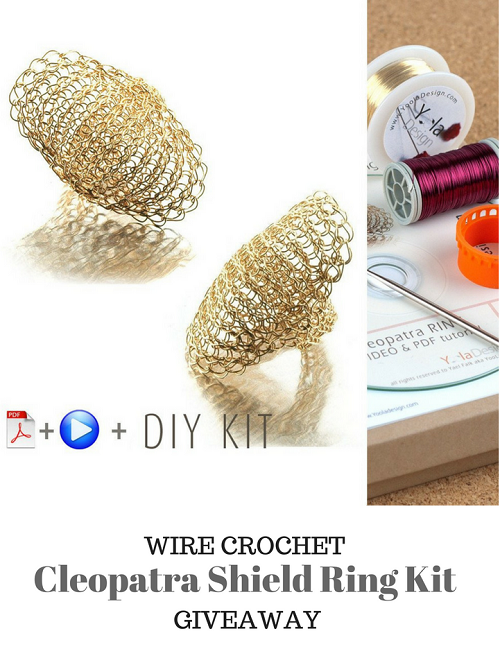 If you'd like to win this giveaway for Yoola Design Cleopatra Shield Wire Crochet Ring Gift Kit worth $59, please make a comment below. Make sure you leave contact info below if you do not have an online shop or blog. It ends in a week's time at 6 pm EST Monday, December 19, 2016. I will pick the winner randomly and announce the results as soon as possible after. So be sure to leave a contact email if you don't have an online link or make sure you come back and check! Otherwise I will redraw in a week. Good luck! I do receive products for review. I also receive a small fee for any products purchased through affiliate links. This goes towards the support of this blog and to provide resource information to readers. The opinions expressed are solely my own. They would be the same whether or not I receive any compensation. I used natural light, my iPhone 6S with the camera+ app and the Modahaus TS320/400 tabletop studio as well as their Rostrum stand. In- app editing with final tweaks in Adobe Photoshop Elements. The graduated grey look is achieved with the black background placed under one of the white ones. Check out my How to Photograph Jewelry Webinar (resumes in New Year). Wow! that looks awesome!! love the ring and bracelet together. Very elegant! Would look great with a little black dress! I would so love to win this!! I've dabbled in crocheting with wire but have yet to master it. This kit looks amazing! Thank you for the opportunity! Merry Christmas and all the very best for a safe, healthy and prosperous New Year! Amazing work! I bought wire from Yoola and it's great quality. Awesome! I love it! Would love to try it! Beautiful and very interesting technique. Yes, awesome! I love the bracelet and would love to have the kit! I have been following your blog for years. BTW Yael also has another tool which creates very viking knit like tubes. 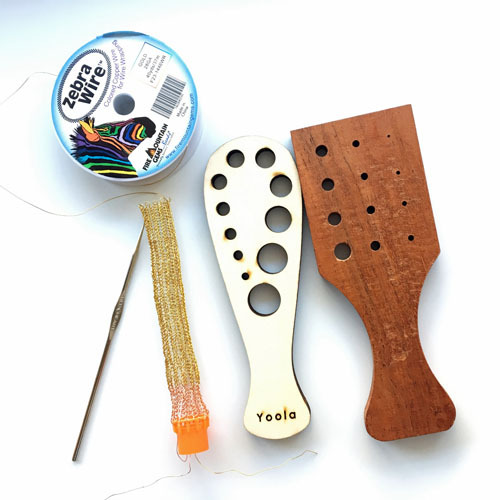 I have a set of Yoola's looms and this technique is much easier than the viking knit and more versatile. It is similar to spool knitting, but it is also different from this. I am still a novice at this technique but it is addicting once you start and it does take some practice to keep the stitches even. Yael provides so much support as well. Little by little I am collecting her patterns. This ring pattern is one on my wish list. Lorriane , hello there ! so glad to hear you keep it up and enjoy ti so much, addicting is something many people report, including me ;) im glad you find my support helpful, I really try to do my best! This is one I don't have and would really like to own. I find her technique to be fun ans easy, though I will never give up Viking Knit as I think they are very different techniques for very different purposes. Kathleen, that is so sweet of you :) !its great to see a familiar face ! Well of course I'd love to win this! I love doing this type of "viking knit" but so far I have only done the necklace. I would love to learn how to do the ring and bracelet. Her designs are just beautiful. I am truly addicted to this method of making jewelry. Thank you Pat , i think you already have the bracelet pattern :) if you lost it , I will be happy to resend it , just drop me a note . This looks so neat! I'd love to give it a try myself! I would LOVE to win this giveaway! As a crochet artist both with beads & without, I'm fascinated with this beautiful technique. Love working with wire. You can even do this while traveling - no thousand seed beads falling all over the place. Beautiful knitting. I love to try. Wire crochet looks like something I'd love to try! Great set of materials. Thanks for this great giveaway! Would love to learn this technique! I tried around a stick and remember it was not easy, but this looks beautiful! It is very different than viking knitting , if this is what you tried , thought im not sure which one is easier or harder , for sure different . What an interesting and clever wire work gadget! I love learning new techniques and am so glad I discovered this blog. I keep saying that I am going to try crocheting with wire, but haven't gotten around to it yet. I always enjoy your blog! Pearl ! :) generous with compliments as always !! what a lovely oriental design , couldn't explain better how versatile the Invisible Spool Knitting technique is ! Welcome Ana to my world of wire crochet :)! I would love to win this. I just started doing wire crochet and I think this would be a wonderful project to work on. Wow, so much writers. I love the ring but there is no chance to win the kit. Sorry for my bad bad english. why no chance Sonja ? :) be positive ! 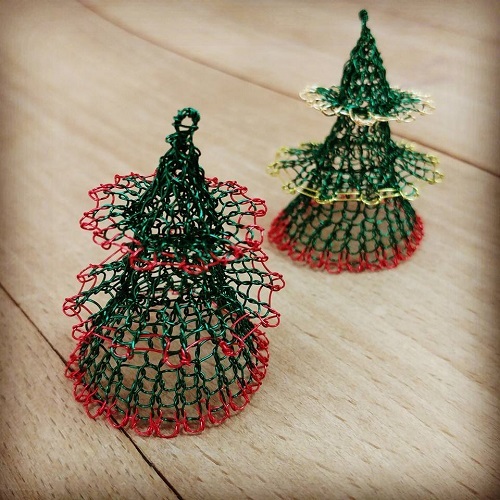 I have been admiring Yoola's designs for quite a while now and I am eager to try wire crochet Yoola style. I always wanted to try this and what better way to try it than to win it!! It would be a nice, no great, prize to win! ha ha !~ perfect way to start something is by winning it, I usually don't win anything though... but maybe you will! Love this technique and all the wonderful things Yael makes. I would love to try the ring. I have done the pendants and necklace too. Ginny ! it's so great to see you hear! we go back for soooo long :) not sure I saw you on YoolaISK group on FB ? Gorgeous kit - fingers crossed! I think you will find that this technique would be easier for left handers as you can do the hooking in the opposite direction. The result will be the same. I've seen this ring before and really admired the design - I would love to learn how to make this. I would love to win this so I can try this out thanks for the chance! Love the creativity and crafting!!! I would love 2 win this kit 2 learn how 2 crochet this very I pretty ring:) I follow u on fb twitter pinterest etc. Every single item is absolutely gorgeous! :) Thank you for sharing. Thanks for the great review, Pearl. For years I've been admiring Yael's work. I always wanted to have a kit. Thanks for doing the giveaway. I have never seen anything like this, this is so cool thanks for the chance. Has the winner been announced? I'm not finding it posted. Thanks.